Leeks belong to the family of onion, garlic, shallots and scallions. They are packed with essential vitamins, minerals and antioxidants. The green leaves actually contain 100 times more beta-carotene and twice as much vitamin C as in the white parts. So do not throw away greens! The combination of vitamins A, C and E as well as other powerful antioxidants in leeks protects your skin against damage by free radicals. Leeks are also a good source of fiber which aids in digestion. They are a natural diuretic and detoxify your skin by flushing the wastes out of your body. Great for cleansing! This soup is perfect for chilly weather. The main ingredients for this simple yet yummy soup are leeks and yogurt. Use the whole leek! I know the green parts are quite tough, but they have more nutrition than the white bottom parts. Lots of fibre from the leek and probiotics in yogurt makes this soup super easy to digest. It is quite rustic, not a silky smooth soup. Make sure you don’t boil it after adding yogurt otherwise it will curdle. Wash and thinly slice leek. Heat a large stockpot and melt coconut oil over medium heat. Add sliced leek, amino sauce, tarragon and minced garlic into a pot and cook until leeks are softened. Season with salt and pepper. Add water or stock, bring up to a boil, cover and simmer on low heat for 10-20 minutes. Puree in batches until smooth using a blender. It should be quite thick. Return to a pot, add yogurt and gently simmer for another 5 minutes on low heat. 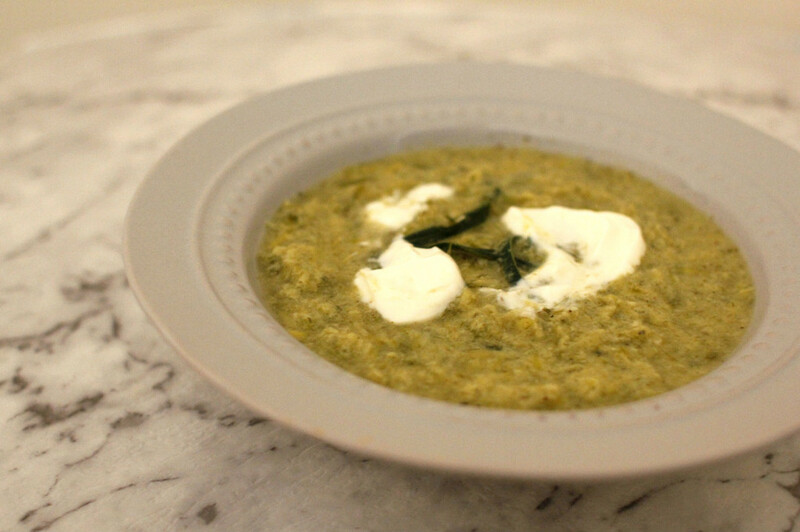 Ladle the soup into a bowl and garnish with tarragon leaves and yogurt to serve.